สรุปข้อมูลจาก BIG DATA ให้เหมาะกับการใช้งาน !!! ReportWorX™ is a powerful reporting tool that turns volumes of data into manufacturing intelligence. Connecting to multiple data sources, including real-time OPC data as well as a variety of databases, ReportWorX processes data from the plant floor, corporate databases and everywhere in between. Based on scalable Microsoft .NET, ReportWorX pushes data into report worksheets and forms leveraging the power of Microsoft Excel. 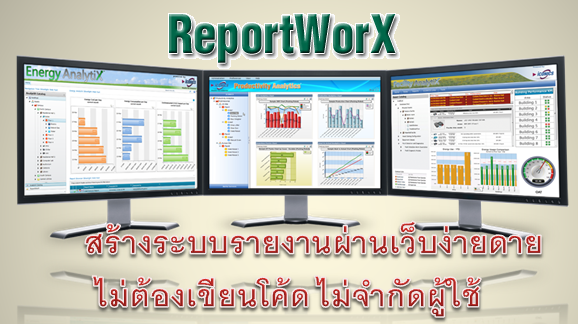 At the heart of ReportWorX is its powerful scheduling engine, which allows for orchestrated execution of reports. These reports can be triggered for execution over the Web, from an HMI screen, or based on user-specified criteria. • Get easy access to even more data with this powerful plug-in for Excel 2010 and 2013. • Streamline the Energy Star reporting process with this convenient new way to generate reports appropriate for submission into the U.S. Government EPA Energy Star initiative. Powerful analytics and reporting on any plant floor or corporate database. Combine information from multiple data sources into one report. Visualize data mapping from multiple data sources. Manage your report layout with advanced data mapping features for rapid development. Efficiently configure, organize and manage all data sources from one location. Save and reuse existing data source mappings. Maintain track of template versions for easy report authoring and management. Quickly revert back to a prior version as needed. Retrieve any necessary data from any business area via the world’s most implemented ERP system.